This is a truly tasty combination of top quality ingredients, another favourite from Whittaker’s. This 50g slab contains creamy milk chocolate made with 33% cocoa which surrounds delicately and deliciously toasted coconut. 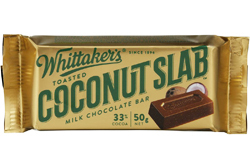 Whittaker’s was established in 1896 and controls its entire manufacturing process, from cocoa bean to chocolate bar, and is New Zealand’s most trusted confectionary brand. Milk Chocolate (Sugar, Cocoa Solids 33% (Cocoa Mass & Cocoa Butter), Milk Powder 30%, Emulsifier (Soy Lecithin), Vanilla Flavour), Toasted Coconut 18%. you have got to try this !!!!! I am 60 years old and I swear this is the best chocolate bar I have ever tasted in my life. As the coconut has been toasted it has a little crunch to it and the chocolate is heavenly. UK residents are missing out on this as they wont know it exists. Coconut Slab it's packed full of coconut wrapped in the most delicious milk chocolate. A triple pack gives you more opportunities to savour the taste.